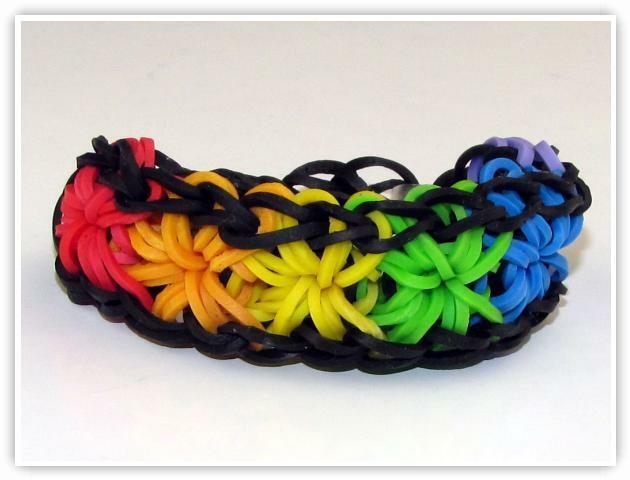 Description: This is an adaptation of the popular Starburst bracelet. It has a similar appearance to the original Starburst, but it is thicker and wider than the original with 8 elastic per cluster (Starburst has 6 per cluster). Starburst patterns are fun to make, because each cluster is a pattern onto itself. You can spice it up by having all the clusters the same color, or alternate colors every other cluster. The one in the video the color of the rainbow for the clusters. 1) Starburst 2 ! ! ! 27) Starburst 2 ! ! !